Violet passed gracefully into the arms of her saviour, September 28 th , 2018 at 90 years of age. Mom was residing at her home in Riverbend Senior Community and recently at Overlander Extended Care Hospital. Mom is survived and will be missed by her loving family, son Darwin (Sheila) Precoor and daughter Tamera (Ray) Morrison. Grandchildren Alexa, Andrea and Andrew (Taylor). Step-children, Doug, Warren, Ron and Peter Brown and families. Step-grandchildren, Johnathan, Michael (Deb), Amanda and step-great-grandsons, Daryl and Riley. Also, her surviving siblings, Irene, Bill, Allan, Austen, Aileen, Ila, Harold, Shirley and Alma. Predeceased by first husband, Arnold Eugene Precoor in 1979 and her second husband, George Donald Brown, in 2011. Also, her parents, Mary (1992) and Joseph (1984) Megyesi, her dearest sisters, Lillian, Helen and Mary, and four brothers, James, Lloyd, Vandale and recently this year, her eldest dear brother, Joe. Mom was born in Bruno, Saskatchewan, May 13, 1928 and came into the world as the fourth eldest of 17 children all delivered by their father in Bruno, Saskatchewan. Her father immigrated from Hungary and her Mom’s family originally came from Hungary, as well. Vi lived in Saskatchewan, St. Louis, and then in MacDowall, until she was 18. In the fall of 1946, Mom went with her sister, Lil, to work at the tuberculosis sanitorium in Prince Albert as Practical Nurses. The spring of 1947 they transferred to London, Ontario where they worked at the sanitorium at Byron, Ontario. In the fall of 1948, they attended four years at the London Bible Institute (L.B.I.) and graduated in April 1952 with a B.C.E. and music, continuing work at the sanitorium to support themselves. They also worked for bible clubs and taught Sunday School in many of the churches in London. During Mom’s third year at L.B.I., she met the love of her life, our father, Arnold Precoor. After grad, they were married in Abbotsford. Dad rejoined the RCAF and they spent the next many years posted to multiple air bases: Hamilton, North Bay, Goose Bay, Toronto (Downsview), Zwiebruken (Germany), Calgary, Comox, Kamloops and Moose Jaw. In 1973, Mom and Dad, retired back to Kamloops. With all this travel, Mom worked when she could. Eventually retiring in 1988 after many years with the Royal Bank of Canada. Mom was widowed in 1979 and remarried to another amazing man, George Brown, in 1988. All Mom’s life, she was known for her love of fashion (pink being her favorite color) and her vivacious approach to life. 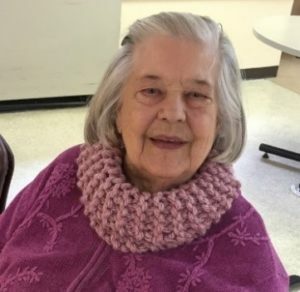 She was fun loving and enjoyed her family, home, travel, flowers and gardening, always with a strong Christian faith and active church life (Christ Community Church). In later years, her zest for living was amplified with the births of her three grand children whom soon became her main focus and joy. The children were privileged to be extremely close to their grandmother and will treasure their many fond memories of her. The family would like to extend special thanks to Eileen Ambler, close family friend. Mom loved her and so appreciated her visits and support. Also, thanks to the staff at Overlander Extended Care Hospital, who managed her care with kindness, tenderness and compassion since her admission in April. Mom had settled in nicely and loved her caregivers. Funeral service at 11:00 a.m., Wednesday, October 3 rd at Christ Community Church, 1132 8th Street, Pastor Mike DeJong presiding. Family is invited to graveside interment at Hillside Cemetery. Mom will be laid to rest at 2:00 p.m.
Should family and friends so desire, memorial donations may be made to Overlander Extended Care Hospital. Condolences may be sent to the family at DrakeCremation.com. My heart goes out to all your family on the passing of such an amazing woman. Tamera, Ray, AJ and Alexa – I will be thinking of you in this difficult time. Violet was a big part of your lives, and she was fortunate to have all of you support and accompany her on her life journey. I am sure she found comfort in the many times you had together, and the support you provided during her difficult days in the past year. While the emotions are probably heavy and feel dark right now, be open as family and friends come around you, to be reminded of the brighter days and the memories that make up the full scope of Violets life. How fortunate for all of you to have known a woman with such strength, joy for life and generosity to her community. She will remain with you in your hearts, your spirits and your actions. Thank you, William. For your words of encouragement and support this week and in this past year. As always, you seem to find just the right words to smooth the soul. Thank you. Thank you for your kind words and support this week and this past year. You always seem to find just the right words to sooth one’s soul. I have many happy memories of us all together Tamera and Darwin. You had such a fun loving mom. I thought a lot of Aunti Vi. She will be missed but remembered fondly! Thank you, Kathy. Unfortunately, you as well know the sorrow of loosing those we love. I think of you often and pray your memories sustain you in your own grief. We are rejoicing in Mom’s life, and know that she is at peace … at the same time … it simply won’t be the same. My dear sister Vi. how I loved her. her laugh I can hear it now, when I visited in August I felt it was the last time , she talked about going home to see her father in heaven well she is home now, we will miss her . good -by and we will meet again I promise. We were so sorry the weather interfered with you and Uncle John attending Mom’s service, she loved you and so appreciated your recent visit. Thanks, Auntie Shirley, for all your love and support. I am so sorry to hear of the loss of your mom and grandma. Tamara and Darwin, I recall when we met as kids. At that time, both of our families had moved to Kamloops, and we were all living at the “Scott’s Motor Inn” until we were settled in our family homes. That was just the beginning, as the good times never stopped, and the pathway between the two families was heavily trodden! There are many memories I have of Vi, but the one thing that immediately comes to mind is her sense of humor! In my mind, I can hear her laughter with such clarity. 🙂 Such great times! Our memories will never die – all we have to do is close our eyes and feel the joy and comfort her laughter still brings! May you be comforted in your loss. So appreciated, Betty’s call and glad to know you are all well. We have fond, fond memories of our many family times together. I expect there will be quite the reunion in heaven. Saddened to hear of your Mother and Grand mother’s passing. Our prayers and thoughts go out to you during this difficult time. We will all miss you Vi, when I needed help you were there, My sister I will love you forever. you never asked questions just gave me what I needed. Will love you forever. We were saddened to hear of your mom’s passing Tam. Mother’s are so special and I know how much you loved and cared for her. Please accept our deepest condolences.